← Jil Sander at Jil Sander, again! The Institute’s press release for the exhibition explains the premise, “a seminal exhibition analyzing the rich history of Spain’s regional clothing styles through the monumental paintings of Valencian artist, Joaquin Sorolla y Bastida (1863-1923). The exhibition will feature more than ten paintings and over thirty rare examples of men’s and women’s clothing and accessories.” This premise is repeated in the introductory text, which consists of five large printed paragraphs on the entrance wall. The text is easy to read (even if a visitor forgot his/her glasses) and gives enough information for the visitor to grasp the purpose of the exhibit without having to read any of the object labels if they choose not to. 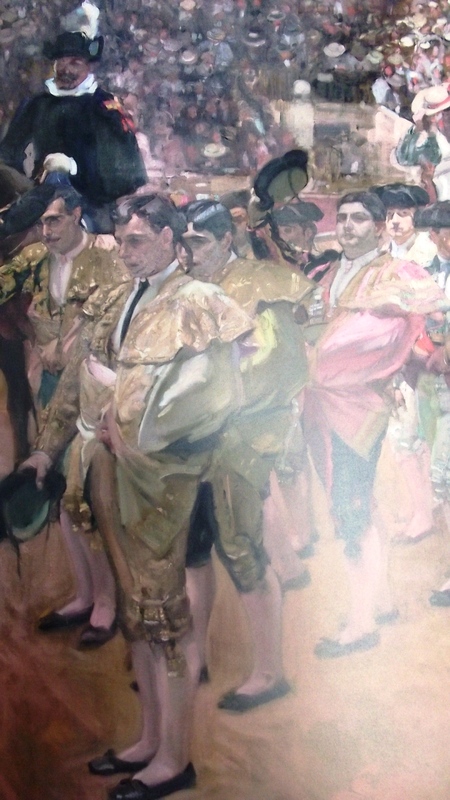 The text explains that you will see paintings by Sorolla next to types of costumes they portray. 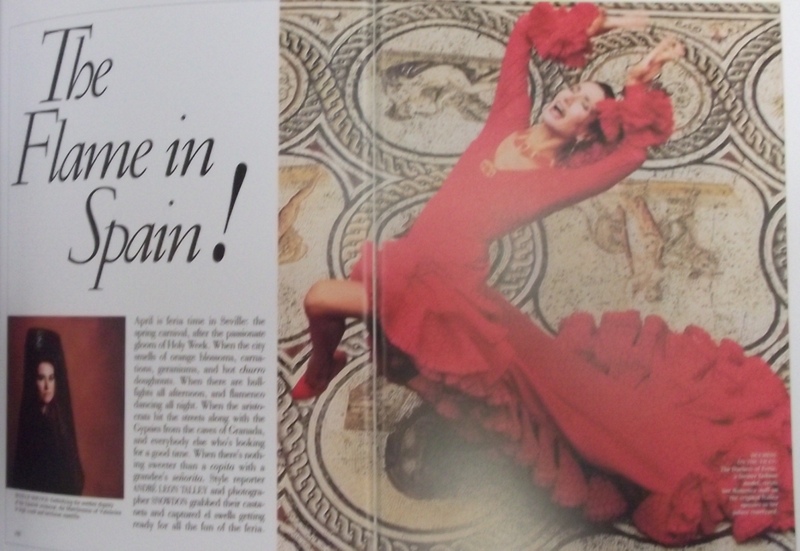 Next to the introduction text is a large black and white photograph of the artist with his large mural Vision of Spain. 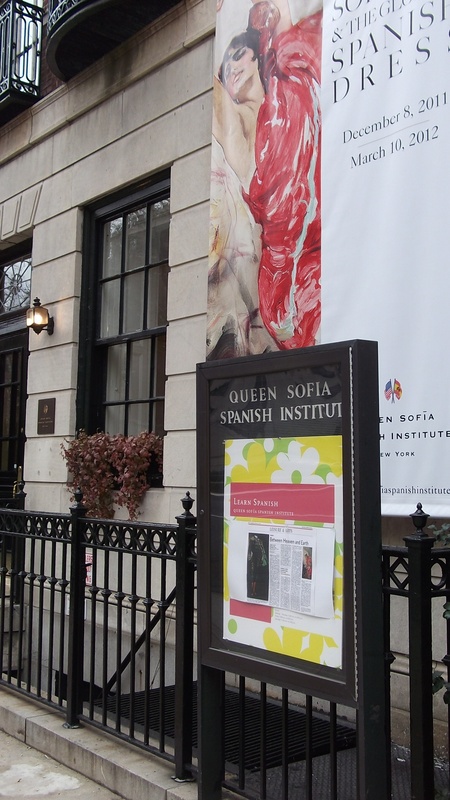 This mural being the original work he was commissioned to paint (which was installed in 1926 at the Hispanic Society of America) and led to the creation of the costume study paintings seen in the Queen Sofia exhibit. The exhibition organized by region of dress; the costumes from each region are grouped near the paintings that represent the same style of clothing. There is not a definite path in the multi-level exhibition, but on my first visit, a docent suggested I start on the lower level and work my way up to the main floor, then end on the third floor. Therefore the viewer can begin anywhere and not be confused, even moving, within in each gallery, from one side of the room to the other. The exhibition is beautifully designed and mounted. The gallery walls were painted pink, orange, and red and worked with the existing yellow walls and purple carpet of the Institute. All the colors picked up shades found in the paintings. The platforms and risers in the cases are painted the same deep purple as the carpet which gives the overall space a seamless effect. A few slanted risers in one case were covered with muslin (not painted purple) to display jewelry, for conservation reasons. All the risers in cases were well lit. The costumes are attractively displayed on unobtrusive mannequins that seem to have been made specifically for each costume (and probably were). One large eye-level wall case displayed jewelry on a large slanted mount. There was only one large label above the objects which used a numbering system to identify each object: a number next to the label object name and a small white numbered head pin next to the actual object. This is a great way to avoid visual clutter when displaying numerous smaller objects when multiple labels could become very confusing. One of the mannequins had jewelry affixed to a chignon and her head: earrings, a mantilla, and ornate hair pins. I did not think the faux chignon (made with the same thick muslin material used for the mannequins head) was necessary. Though they were trying to show how the pieces were actually worn with the ensemble, the rest of the jewelry was shown neatly on a riser near the mannequins. Since this was the only mannequin with faux hair in the exhibition, it broke visual continuity. Everything is securely displayed in closed cases. The display elements further the exhibition’s aims, adding even more Spanish flavor to the paintings and objects on view. There is piped-in Spanish music in the galleries. On my first visit, it was a bit loud and distracting. On my second visit, they had lowered the volume quite a bit; perhaps they had complaints. One of the paintings depicts a man from North Western Spain playing the bagpipes and on that first visit, the soundtrack played a bagpipe song, which would be confusing if you happened to miss this particular painting and not know that this region of Spain is Celtic. I did not hear this song on the second visit and wondered if they removed it for that reason. The top gallery floor has a large video monitor (and seating) showing footage of Jackie Kennedy’s visit to Spain with the Duchess of Alba from 1966, and the Hermitage of the Virgin Festival from 2010. 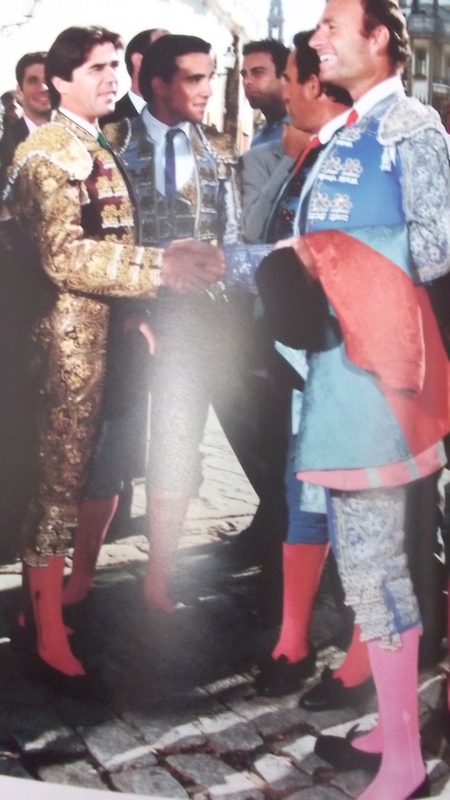 This really enhanced the exhibition, because it was interesting to see live people walking, dancing, moving and even on horseback in regional costumes both past and present. I overheard one visitor say, “I wish it had sound, music.” Perhaps they chose not to use the video sound so as not to compete with the piped in music in the adjoining gallery. In the main gallery on this floor there is a wall case that contains printed materials, such as Vanity Fair, Life, and Harper’s Bazaar magazines, opened to articles related to contemporary Spanish fashion. This case was quite dark and I realized it had no source to light it. Someone thought the large ceiling chandelier in the room would be enough illumination for the case, but I could hardly see the images, or read the small magazine text. Above this case was wall text written by the curator, André Leon Talley, which summed up the exhibition and explained how the influence of Spanish culture is important to designers and continues today. On the left wall of this gallery was a huge reproduction of Sorolla’s Vision of Spain, and on the facing wall were two more large reproductions of details from the same painting. The far wall contained the exhibition’s grand finale: a huge case displaying contemporary designers interpreting Spanish influence in couture costumes. 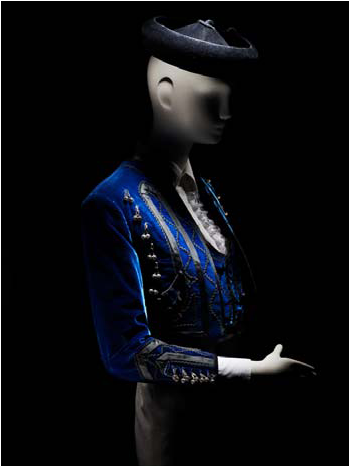 There are costumes by Karl Lagerfeld for Chanel, Stefano Pilati for Yves Saint Laurent, Carolina Herrera, two looks by Christian Lacroix, Ralph Lauren, and Oscar de la Renta. This room was my favorite, because you could see every influence from the paintings and costumes on the two previous floors channeled into these amazing couture creations. There is a beautiful exhibition catalog reasonably priced at $45 dollars, however, like most catalogs, it does not contain everything seen in the exhibit, as the catalog must be written, edited and printed well before the exhibition opens. 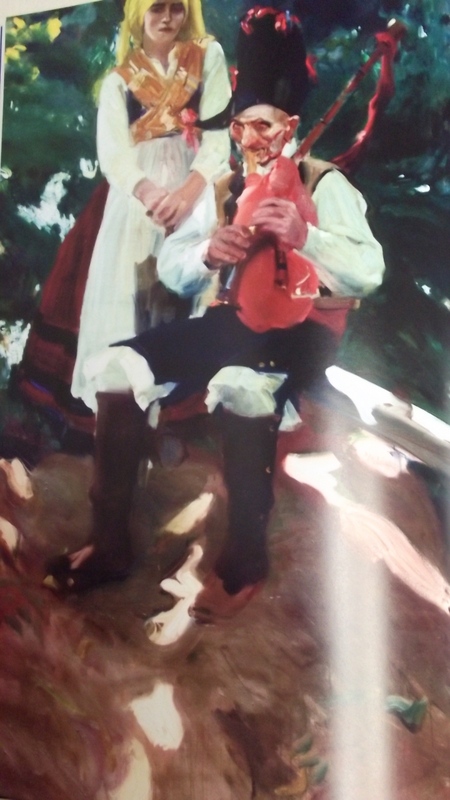 But, it is a thorough catalog that delves more deeply into the art of Sorolla and regional Spanish dress. I think the visitor will take away knowledge of regional dress they may have never known about at all if not for this exhibition, as well as the work of Joaquin Sorolla, which is what I learned from the show. It also reminded me to add a visit to the Hispanic Society of America to my to-do list. I have recommended this exhibit to my colleagues and friends, and many people I know have already seen it, and all have enjoyed it very much. I just experienced this exhibition with someone with an expert eye. Thanks for taking me through this amazing exhibition Ms. Hemingway. I feel like I was there (and I wish I was!). 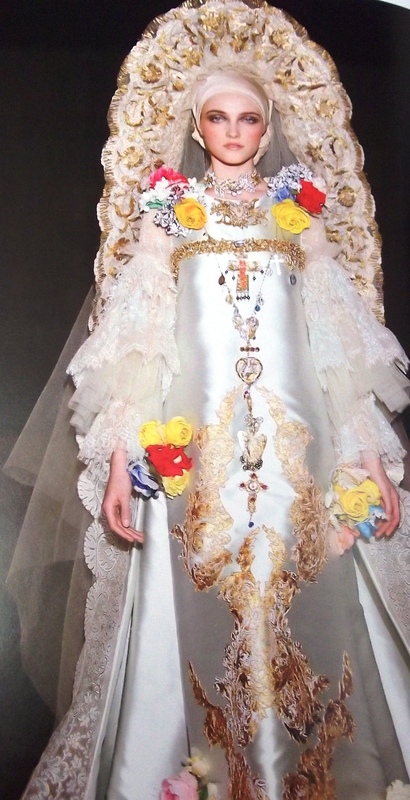 I especially would have loved to see the contemporary couture garments and how the designers interpreted Spanish influence in costume. Sounds so amazing! I agree with you on displaying the accessories separately and not on the faux chignon…I like to say “all or nothing”. Same with wigs in an exhibition…usually do them all or nothing. Wish I could see this exhibition! Fabulous! Sorry to have missed the exhibition, but thank you for the review, Jill. Who knew there was a Celtic region in Spain?! Will have to keep an eye out for the catalog. Thank you for this report, Jill! I was disappointed I didn’t see the show before it closed, so this was the next best thing! Sounds like it was beautiful. I went when this first opened, and you really noticed all the things I did! I loved it also, and it’s interesting to see a review that includes details about the exhibition design. Now I need to get or borrow your catalog! Looks like I’m not the only one who’s sorry now that he (or she) missed the show. Thanks for sharing your experience of it. It’s an excellent account of what sounds like a beautiful show. As complete as your review is, however, I wonder why you didn’t include something more about the labels. Maybe it’s because they weren’t that interesting to read (you even implied that, given the intro text, perhaps they didn’t add that much to the exhibition), but your description of the exhibition is so freaking thorough that I’m left wanting to know at least how the labels were displayed. (This is a minor point. In truth, I don’t want to hear any more about labels than I already do, every day.) Your review may be the next best thing to actually having seeing exhibition. Sorry I missed the show, glad I read this. This show sounds amazing, thank you for bring it to life for those of us who missed it! The couture pieces at the end of the show must have been exquisite-LOVE the Lacroix that’s shown!! Jill, your review is fantastic. It’s too bad this couldn’t be posted earlier–I think you would have helped to bring in a lot more visitors! You obviously took a lot of time to consider and write about each aspect of the exhibition. If only every review could be so thoughtful, intelligent, and professional!